Grandma raved about this one. 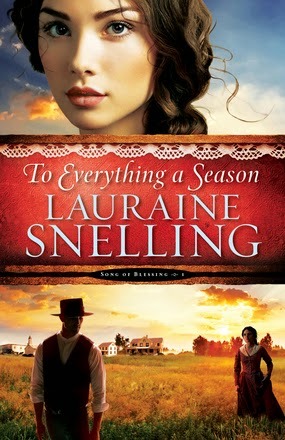 Read below to see what she says about To Everything a Season by Lauraine Snelling. To Everything a Season is one of the best books I have read and is one that once started, I did not want to put down. I have read many of Lauraine Snelling's books, and I will have to say this was a favorite. The story begins in Blessing, ND with concern about Far, who had previously suffered a stroke. His daughter is a doctor and practices in Blessing along with her sister-in-law, Elizabeth. The two doctors have agreed to have some student nurses come to their hospital for training. One of the nurses, Miriam, is having a difficult time leaving her family and her sick mother and siblings She is encouraged that this was in her best interest. During this period Trygve returns home in time for a bank robbery to occur, in which a young boy is seriously injured while being watchman for his brothers, the robbers. The doctors take care of him, and some people in the community, along with the student nurses, help him recover. This is a love story, a story about life, caring, and faith. There is so much action and so much to say about the characters, that it is hard to review without giving the story away. I highly recommend To Everything a Season, and I think everyone who reads it will enjoy it as much as I did.